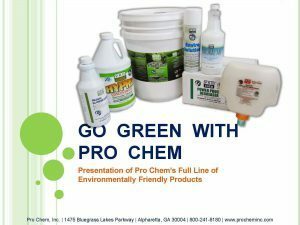 Pro Earth Glow-N-Shine | Pro Chem, Inc. PRO EARTH GLOW-N-SHINE is a soy-based solvent that cleans, degreases and polishes in one easy application. Product can be used full strength or diluted for cleaning water-based soils. Safe on all surfaces not harmed by solvents. Do not use on plastics. Remove food from area. Appliances must be turned off and cool. Apply small amount of product to clean dry cloth or wiper. Heavy grease areas may require additional product or applications. Wipe surface clean in the direction of the grain and buff to the desired luster. Avoid contact with painted surfaces such as elevator buttons or grill logos. Product may remove paint over repeated usage. FOR WATER-BASED STAINS SUCH AS COFFEE, TEA, ETC: Dilute product 1:4 with water and shake well before applying to stain, then follow directions above. Due to separation, diluted product will need to be shaken thoroughly before each use.